The name says it all! 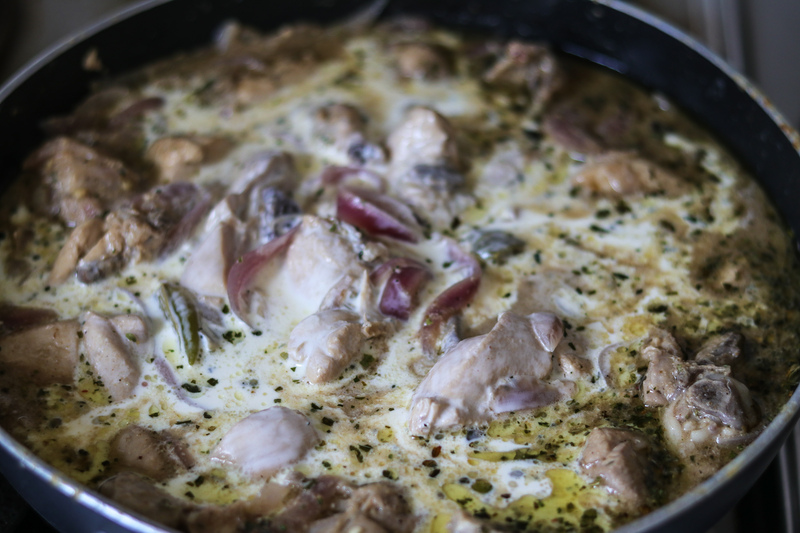 ‘Cream Chicken’- Succulent chicken pieces simmered slowly in a mix of flavourful spices, and rich cream.This dish is perfect for this weather, when it is starting to get a bit chilly, and the skies are getting a little darker. 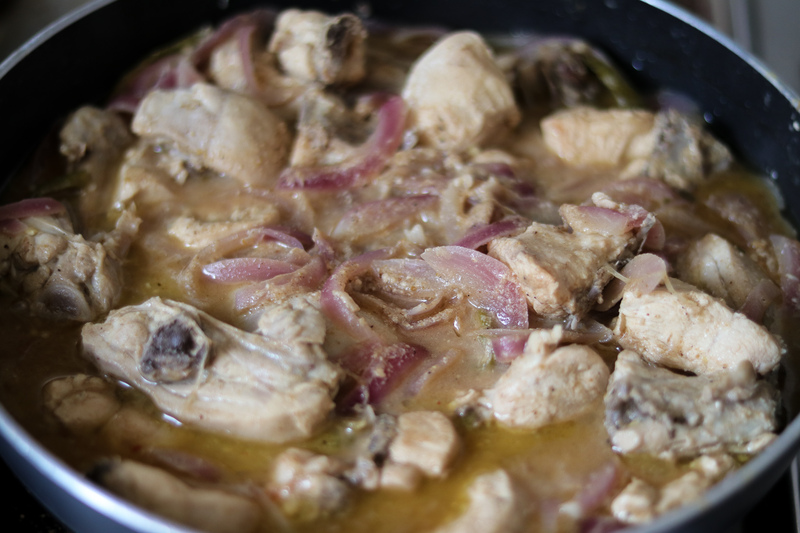 All you need is warm comforting food at the end of the day, with your family. It is not something that you can have everyday, as it is not light.yes! and I will not pretend it is. 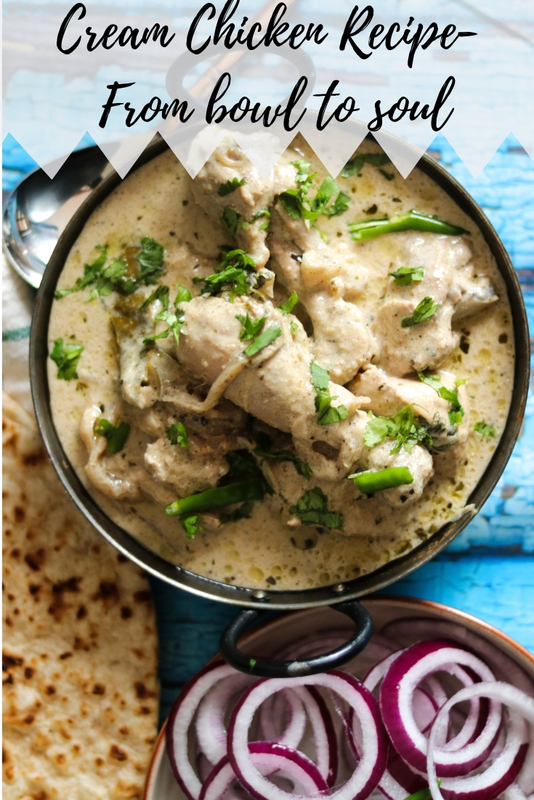 It uses a lot of cream, but of course somedays when you are craving for some luxurious comforting food, this delicious creamy gravy with a side of steamed rice, or buttered naan, or even just plain roti/bread , is all what you want!! 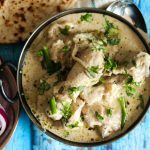 This recipe is really quick, and you do not need too many ingredients, neither there is too much chopping, as in other Indian gravies. 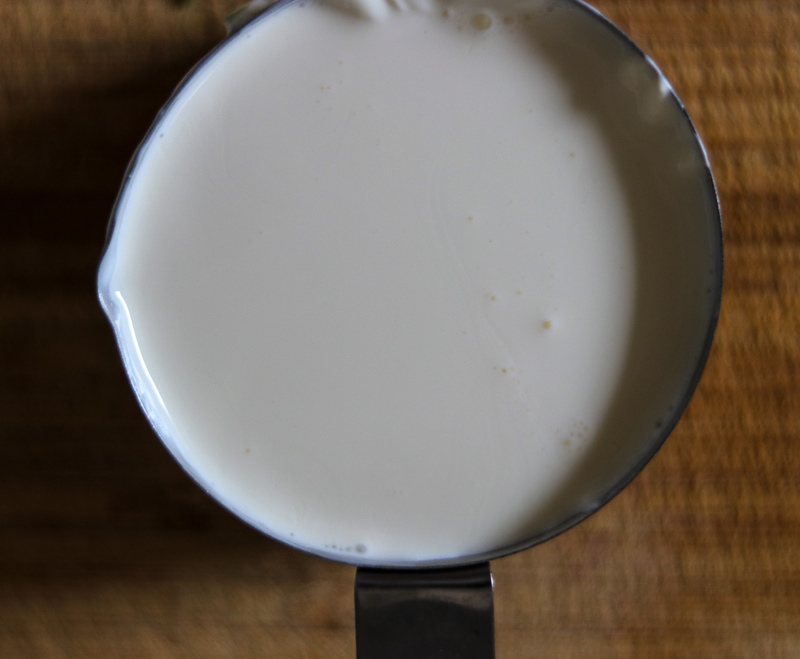 I make this recipe in ghee, but you can use butter(that makes it more rich), or any oil … but if you are anyways using cream, then a 1-2 teaspoons of ghee really does not matter. Might as well, make it the way it is supposed to be cooked. Right ? 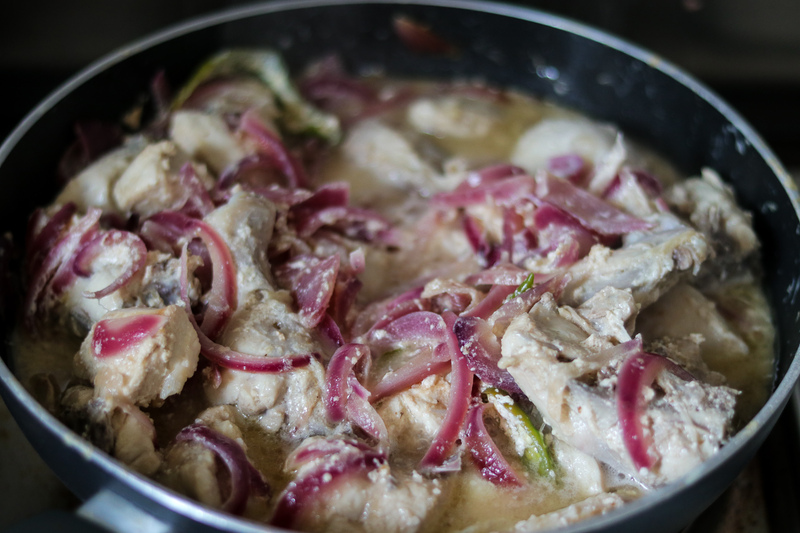 This is one of my favourite chicken dishes. 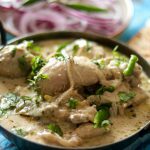 Amritsari Cream chicken is quite a famous chicken recipe in Amritsar (My hometown).This is not exactly the same recipe, but very similar, and tastes just the same.Lets get started with the ingredients and recipe details. 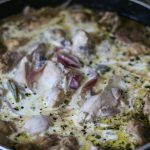 The main ingredients needed for this recipe are-ghee (or butter or any oil) for cooking, onions, green chillies, ginger garlic paste. 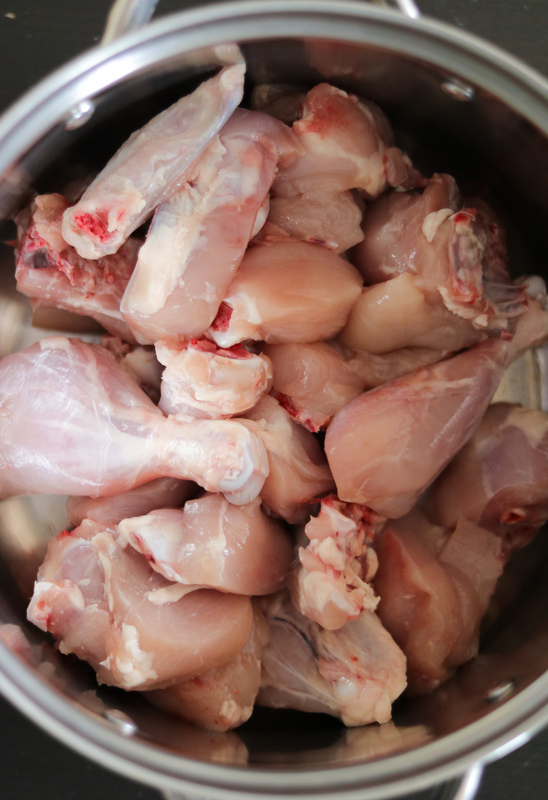 I use whole chicken with bone, but this tastes as good if you use boneless chicken. 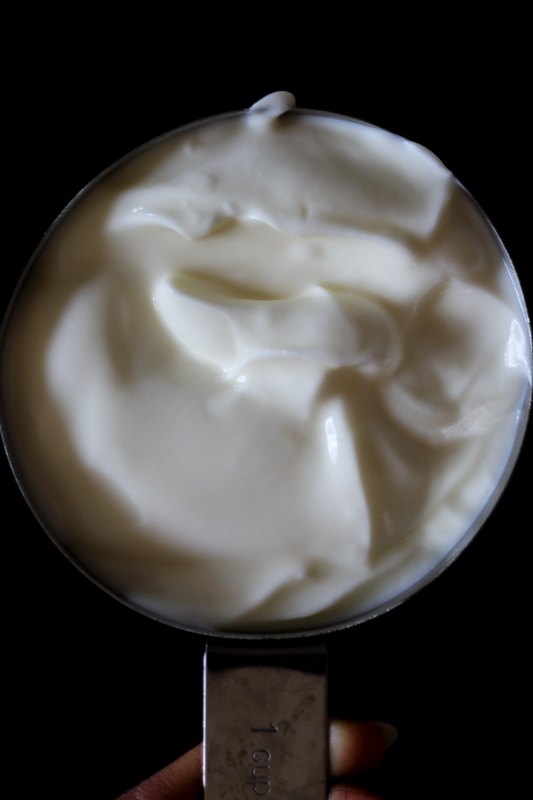 Other ingredients you need are fresh yoghurt (curd), and cream. 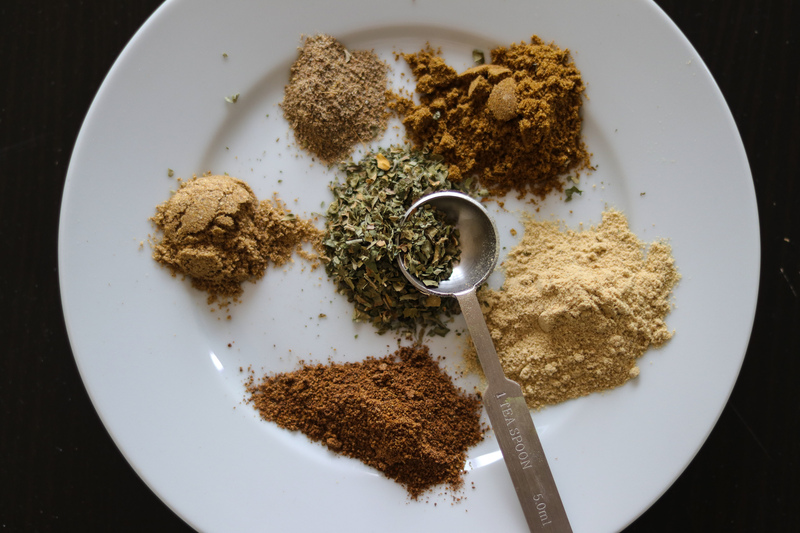 Dry ingredients required are-salt, cumin powder, coriander powder, white pepper powder (you can use black pepper powder), garam masala powder, Cardamom powder, kasuri methi (Dry fenugreek leaves), fresh coriander leaves. 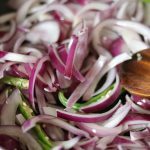 Sauté sliced onions and sliced green chillies in hot ghee. Do not brown these, just sauté it for 2-3 minutes, till it is transparent. 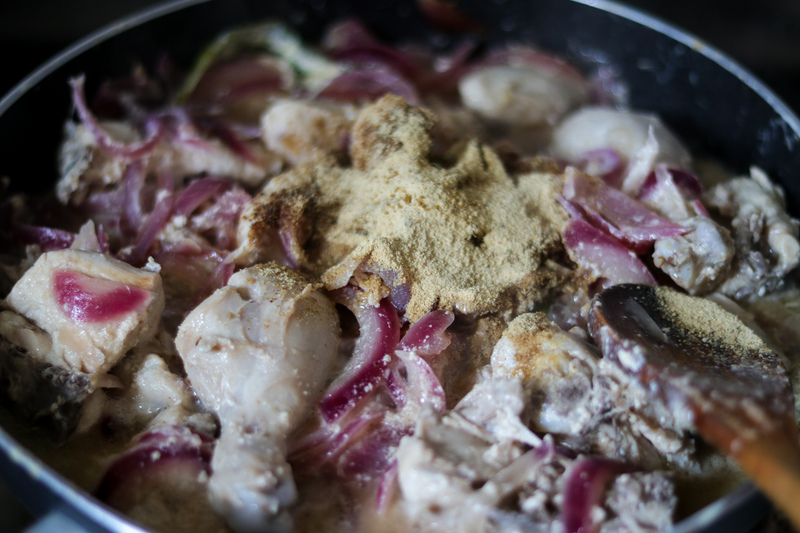 Add ginger garlic paste, and sauté for another 3-4 minutes, till the raw aroma goes away.Add chicken pieces. Mix well. 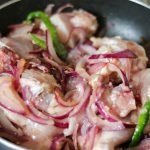 Add a cup of yoghurt, and a little salt.Cover and let it cook, on slow heat for 10-12 minutes, till the chicken is half cooked. 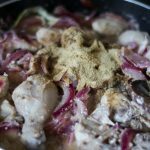 Open the pan, and add the dry spices- cumin powder, coriander powder, pepper powder (white or black),garam masala powder. Add a little water. Cover and cook again for another 10-15 minutes. 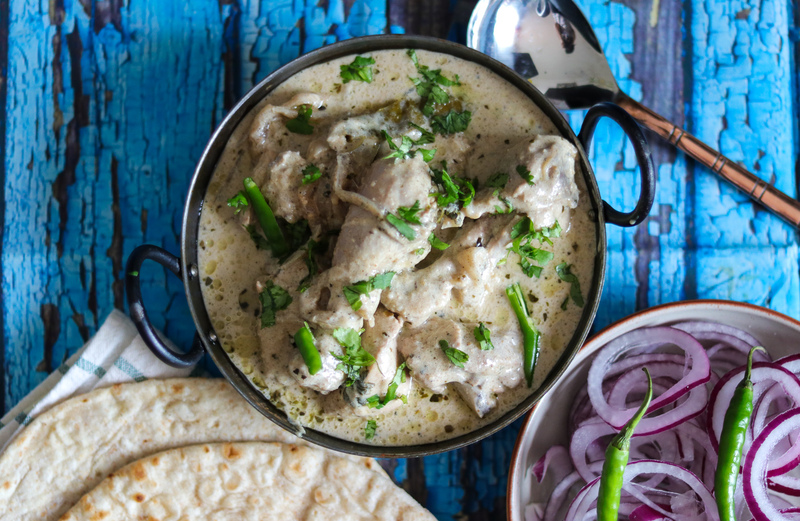 Once done, add a cup of fresh cream, cardamom powder, mix well, and cook on slow heat for another 10 minutes, till the chicken is done.Check for seasoning, and add it accordingly if required. Add kasoori methi.Mix. 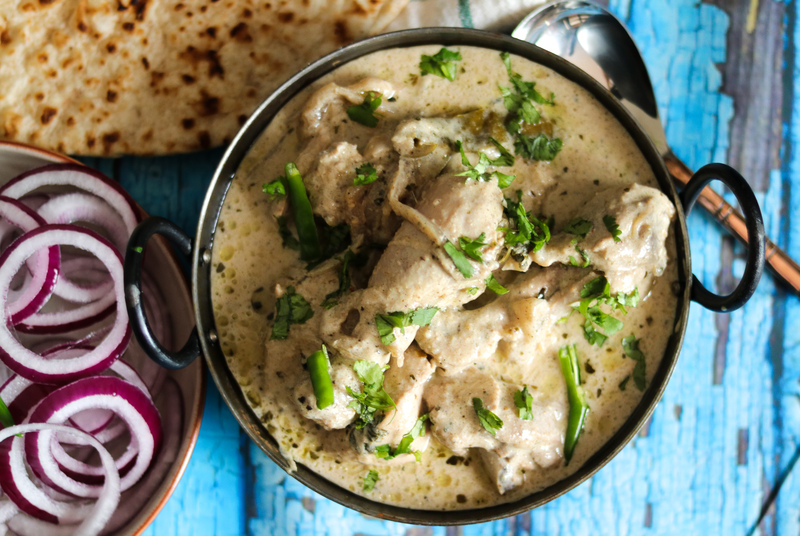 Garnish it with fresh coriander leaves, and serve hot with naan, roti, rice, and salad. 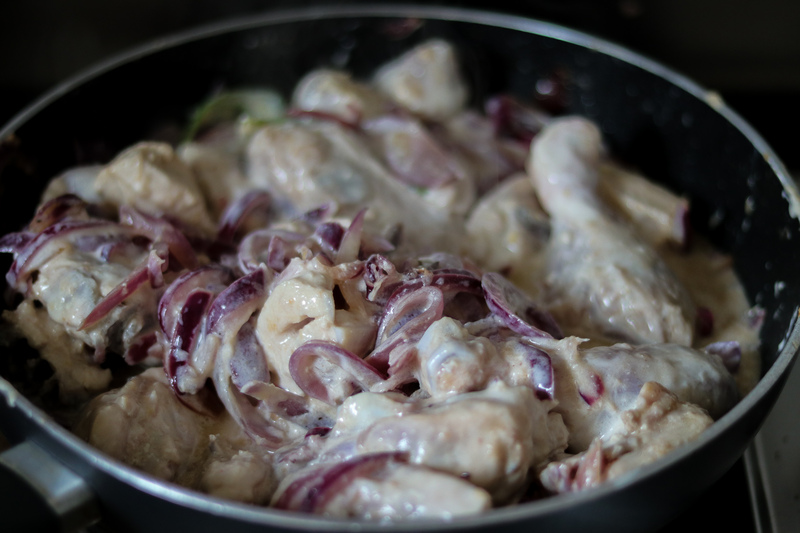 Other chicken recipes on the blog-butter chicken, chicken curry, grilled chicken and veggies . 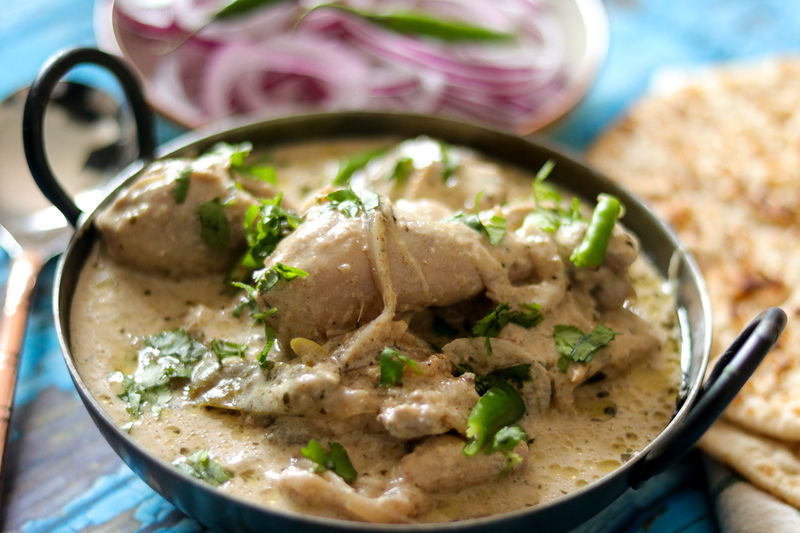 ‘Cream Chicken’- Succulent chicken pieces simmered slowly in a mix of flavourful spices, and rich cream. 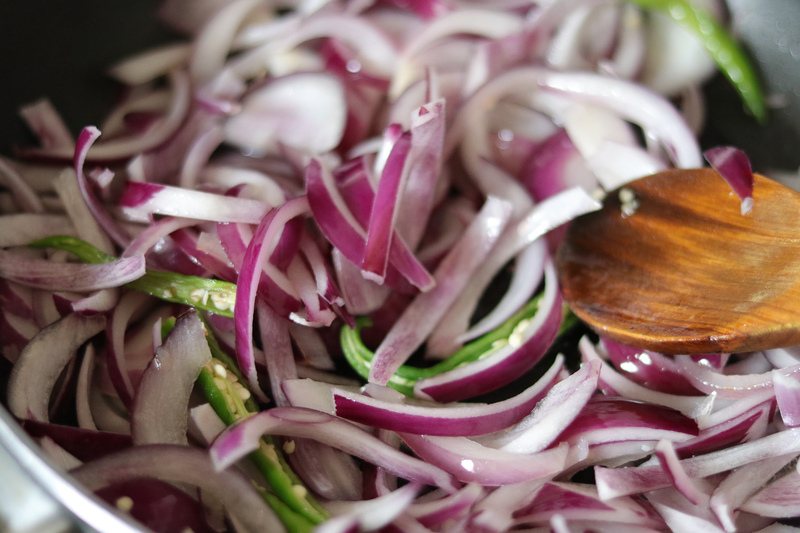 Sauté sliced onions and sliced green chillies in ghee. Do not brown these, just sauté it for 2-3 minutes, till it is transparent. 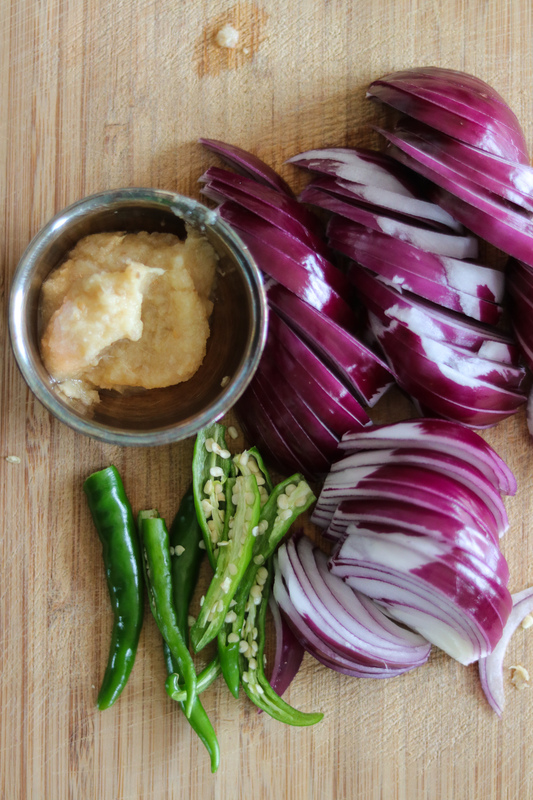 Add ginger garlic paste, and sauté for another 3-4 minutes, till the raw aroma goes away. 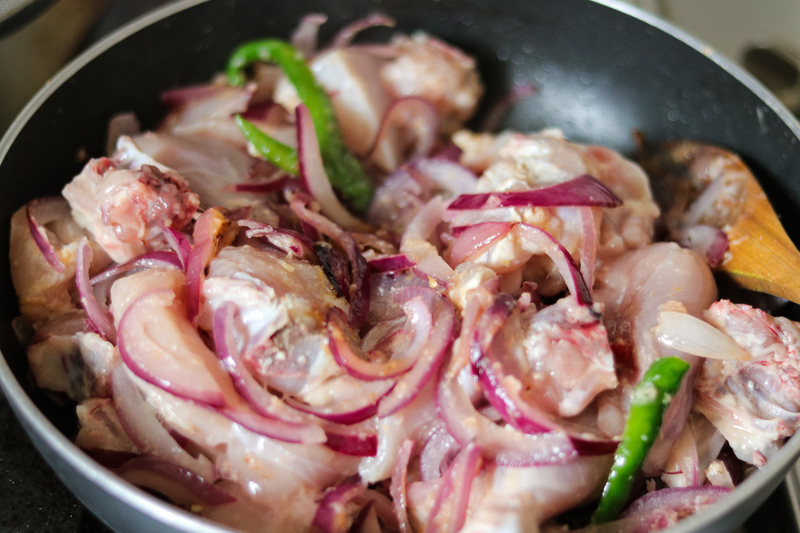 Add chicken pieces , and mix well. 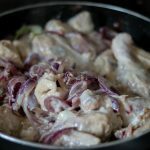 Add yoghurt, and a little salt.Cover and let it cook, on slow heat for 10-12 minutes, till the chicken is half cooked.